Tomorrow marks the official start of summer and I couldn’t be more excited! Although I can’t imagine the weather shifting too much here in California, I am very much looking forward to beach vacations, hikes and camping trips, and other summer adventures. While these activities tend to get my skin glowing from all the sun, exercise, and fresh air, sometimes – for a special occasion, night out, or just for fun – I’ll desire an extra dose of sheen and shimmer. And that’s where my favorite luminizers come in, like this luxurious, non-toxic beauty from lilah b…. 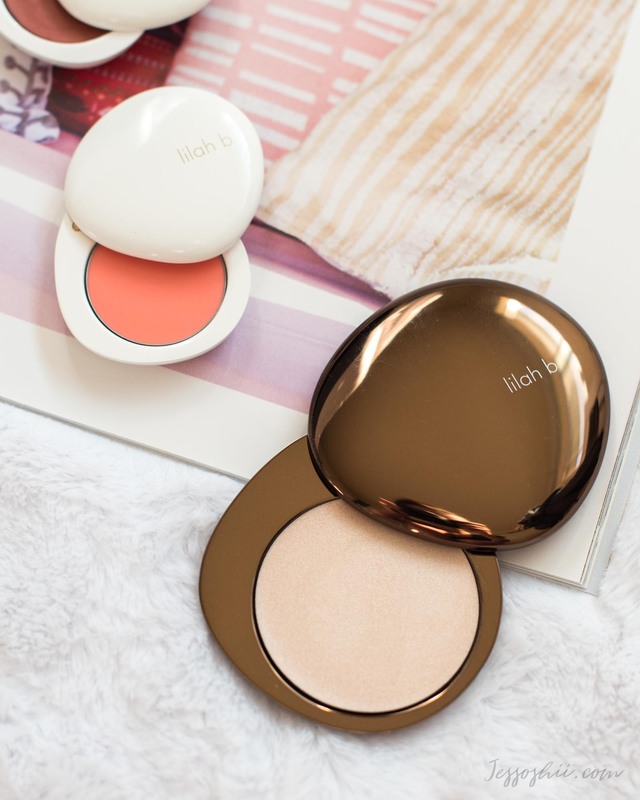 Following suit with the rest of lilah b.’s makeup range, their Glisten + Glow Skin Illuminator is pocket-sized multi-tasker. By combining Mother of Pearl, quartz powder, and other finely-ground minerals, it adds instant luminosity to all areas of the face – from the brow bones and inner corners of the eyes, to the cheekbones and cupid’s bow. It can be used to highlight and sculpt, or simply add a touch of radiance. The Glisten + Glow Skin Illuminator can also be used as a base or top layer over other products, like blushes, eye shadows, and even lipsticks. This allows you to create completely new and custom looks using your current makeup wardrobe. For example, add a dab over matte lipstick to add some dimension. Or, top them over eye shadows to add some extra shimmer, or use them as a base to boost their vibrancy. And on top of its variety of uses, Glisten + Glow also functions as skincare. It helps perfect your complexion as you wear it and promote natural radiance, with ingredients like black currant seed oil extract, sunflower oil concentrate, carotenoids, plant sterols, essential fatty acids, and brown sea algae. Glisten + Glow is also free from gluten, parabens, phthalates, sulfates and synthetic fragrances. Cruelty-free (though not vegan), and made in Milan, Italy. Lilah b.’s Glisten + Glow Skin Illuminator comes in one universally flattering shade – a neutral, pearly pale champagne. Though it is very pigmented, the formula allows for quite a bit of flexibility. One layer adds the slightest hint of color and sheen to lift and illuminate the cheeks, topped off with a mix of pink and pale green micro-shimmer. With two plus layers, that’s when the satiny Mother of Pearl base really starts to build up, creating a pearly sheen with an almost strobe-like effect. While on pale skin, this effect is quite subtle, medium to dark skin tones will see a much more dramatic effect (so start light!). When it comes time to apply, I’ll simply swivel the top of the bronze stone-shaped compact, swirl my finger in the pan for a few seconds to warm it up, then dab it straight onto the cheeks and brow bone (and anywhere else I want to add a glow). Despite the very oil-rich formula, the texture actually feels part-cream, part-powder. It’s silky, but not slippery or greasy. The formula blends out effortlessly – no brush or blender required – and sets to lightweight, powder-like finish. I could definitely see this working well for all skin types – oily especially as it helps hydrate without feeling heavy, or worse, sliding away after only a few hours of wear – huge plus! What are your thoughts on lilah b.’s Glisten + Glow Skin Illuminator? Have you tried any of her other products? Let me know below!